Please ask all class questions here in this thread. I have emailed the assignment, but I am not sure that I have the correct email. I did not see it on the website. Can you please confirm the class email. I was just accepted into the class and I too cannot find the class email on the website. The email is on the left side of the screen home page. You can hover over it and it shows up on the bottom (as the image shows) or you can click it and it will open a new email in your email client. I was wondering when the next lesson will be posted? Wanted to mark it on my calendar so I kind of know when to come on and do the assignments! I noticed that only Lesson 1 and Assignment 1 are up right now. Yes, Sorry the assignment and lesson will be up today. The due date will be extended accordingly as well! thanks for your patience. 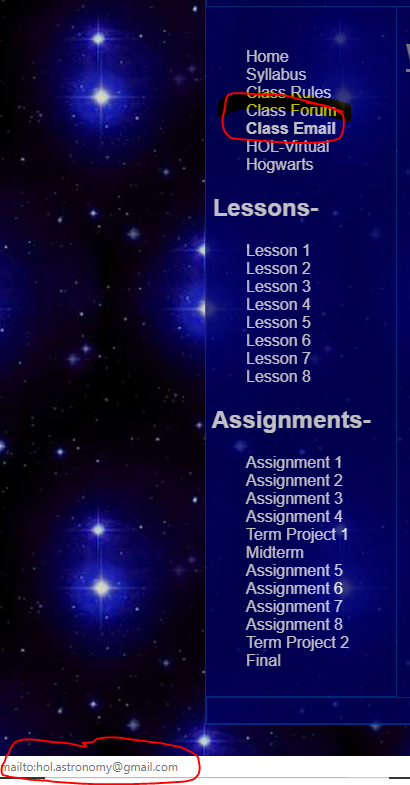 For new students joining Astronomy this term, you will be starting with Lesson and Assignment 5.